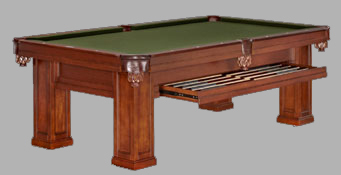 The Allenton is an enhancing table with its pearlized shaped sights. Available in Espresso, Chestnut, Driftwood or Tuscana finish and two leg options of Ball & Claw and Tapered Legs. It has a high performance nut plate construction. It is available in a 7ft and 8ft size table. The Bayfield can add high quality details to your game room. With the solid wood rails, leather shield or fringed pockets and pearlized diamond shaped rail sights. Available in 8ft or 9ft, it is offered in Matte Black or Two Tone finishes and comes with standard legs. The Black Wolf II gives off a contemporary element of its casual chic to sleek and sophisticated look in your game room. Its durable metal and apron corners, round rail sights and jet-black laminate can offer a lifetime of enjoyment. It is available in both 7ft and 8ft with the choice of having a gully return or drop pockets. The Oakland has its straight lines, simple designs are trademarked characteristics of the Arts and Crafts style that was usually purchased during the 1890s to 1910s. Available in a 8ft Chestnut finish color, with a side cabinet drawer for storage so you can experience and ultimate game rush with this table in your home. The Tremont has its classic profile, arched base frame, carved corners and solid wood ball and claw legs that embodies the design characteristics of the table. With the option only available in a 8ft size, choose between a Chestnut or Espresso Finish with sheild pockets to add an accent to your table.